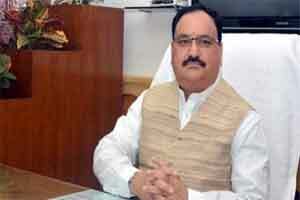 UNITED NATIONS: Union Health Minister J P Nadda was named by UN chief as a member of the first high-level UN advisory group of a global movement, that will address the major health challenges faced by women, children and adolescents. The high-level advisory group of ‘Every Woman Every Child’ will be co-chaired by Michelle Bachelet Jeria, President of Chile and Hailemariam Dessalegn, Prime Minister of Ethiopia. The advisory group will help provide leadership and inspire ambitious action for women’s, children’s and adolescents’ health during the transition from the Millennium Development Goals to the universal Sustainable Development Goals agenda, UN Secretary-General Ban Ki Moon said in a statement. The two alternate co-chairs are Tarja Halonen, former President of Finland and Jakaya Mrisho Kikwete, former President of Tanzania. “Women, children and adolescents are at the heart of the 2030 Agenda. Continued commitment, leadership and action will be critical to achieving our goal of ending all preventable deaths of women, children and adolescents by 2030 and enabling them to reach their full potential,” Ban said. The initial members announced will be expanded with additional key leaders to make up to 15 members, the statement said. With initial appointments lasting for one year, the group will meet twice yearly to report on progress, key challenges and provide recommendations on issues such as financing, accountability and implementation of Every Woman Every Child and the Global Strategy for Women’s, Children’s and Adolescents’ Health.